A vital and necessary ingredient is the dedicated and knowledgeable volunteer ski school. 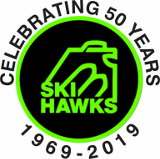 They provide safe ski instruction and guiding by qualified ski instructors and ski guides to the club. The ski school offers instructional training with one full day skiing on Saturdays. Over the years, a unique system of skiing for the visually impaired has been developed by Ron and Barbara Lusher, the founding ski school directors. Skiers can be taught to ski down the most difficult ski slopes safely. A skier's well trained instructor or guide follows the skier closely, calling out simple directions. Blind and visually impaired skiers always ski one-on-one, one student with one instructor/guide. It was great to get out skiing again after not being able to do much of it the last several years as my vision deteriorated. Last night was the first time I skiied in two years, so I was a bit rusty. I also had my doubts that I could actually ski withought seeing much of where I was going and what was around me, depending on taking instructions from a sighted guide through the radio system. It was really amazing to discover that I CAN ski while following directions from a sighted guide. It was really fun and I am looking forward to getting out again next Wednesday. To get more information please complete our contact us form.